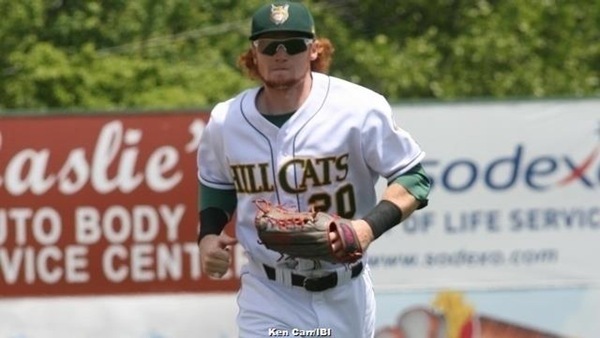 First, the Indians should be pleased by the quick development of outfielder Clint Frazier. Frazier is the Indians 2nd ranked prospect and he is also MLB’s 37th ranked prospect. Frazier was the 5th overall pick in the 1st round of the 2013 MLB Draft. The young outfielder had a great season in high single-a. Frazier will start next season at double-a. Frazier this past season shown why he is a 5 tool outfielder. Frazier hit at a good .285 (143-for-501) batting average with 16 home runs, 72 RBIs and 15 stolen bases. Frazier’s power is kicking in, but not shocked that this doubles machine racked up 36 this year. He hit 3 triples to go with his great season. In addition, Frazier needs to cut down on the strikeouts. He struck out 161 times in 2014, but this year he improved by cutting down 36 k’s. He struck out 125 times this year. Hopefully next season he can improve again and try and not to strikeout more than a 100 times. Frazier is a good defender, but when he reaches the Major Leagues he will most likely shift to right field due to his lack of top notch speed. He has speed, but not like Jacoby Ellsbury or Kevin Kiermaier. Frazier gunned out 6 runners. That number will improve every year with him getting bigger and stronger as he looks to make his way to the pros. My Prediction for Frazier for next season in double-a he will hit .280 with 25 homers and 87 RBIs. Also he swipes 20 bags, guns out 10 runners, and strikes out 95 times. Grade: B+ for the 2015 season. I remember there was a lot of talk about him at the Midwest League All-Star game of the Indians being so high on him. I was able to see him play then, and at Lake County one game. I never seen him play in public, but I would love to watch him play and eventually he I will. Sometimes I get lucky, and am able to see some pretty good prospects at the Single-A level. Yea same here. I usually go to The single-a games of the Yankees, Rays, and Pirates affiliates. Bowling Green is the only MWL stadium I haven’t been to. Hopefully I’ll get my transfer to Kentucky, and I can remedy that next season! That would be cool and I hope you get to do it. I would like to go see the Blue Jays single-a in Dunedin . I’d love to do a ballpark tour of the Florida league. Lots of great parks and history there with many teams. The crowds probably wouldn’t be too bad in April after spring training, either. Plenty of chances to get a foul ball!